Sub-regions of Europe according to Eurovoc. The pre-1989 "Eastern Bloc" (orange) superimposed on current borders. The Intermarium concept overlaps with many definitions of this region. 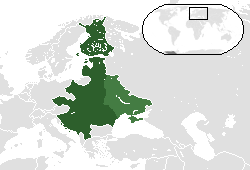 The term CEE includes the Eastern bloc (Warsaw Pact) countries west of the post-World War II border with the former Soviet Union; the independent states in former Yugoslavia (which were not considered part of the Eastern bloc); and the three Baltic states – Estonia, Latvia, Lithuania (which chose not to join the CIS with the other 12 former republics of the USSR). The CEE countries are further subdivided by their accession status to the European Union (EU): the eight first-wave accession countries that joined the EU on 1 May 2004 (Estonia, Latvia, Lithuania, Czech Republic, Slovakia, Poland, Hungary, and Slovenia), the two second-wave accession countries that joined on 1 January 2007 (Romania and Bulgaria) and the third-wave accession country that joined on 1 July 2013 (Croatia). According to the World Bank 2008 analysis, the transition to advanced market economies is over for all 10 countries that joined the EU in 2004 and 2007. According to the Organisation for Economic Co-operation and Development, "Central and Eastern European Countries (CEECs) is an OECD term for the group of countries comprising Albania, Bulgaria, Croatia, the Czech Republic, Hungary, Poland, Romania, the Slovak Republic, Slovenia, and the three Baltic States: Estonia, Latvia and Lithuania." The term Central and Eastern Europe (abbreviated CEE) has displaced the alternative term East-Central Europe in the context of transition countries, mainly because the abbreviation ECE is ambiguous: it commonly stands for Economic Commission for Europe, rather than East-Central Europe. ^ Inotai, András (Autumn 2009). "BUDAPEST—Ghost of Second-Class Status Haunts Central and Eastern Europe". Europe's World. ^ Z. Lerman, C. Csaki, and G. Feder, Agriculture in Transition: Land Policies and Evolving Farm Structures in Post-Soviet Countries, Lexington Books, Lanham, MD (2004), see, e.g., Table 1.1, p. 4. ^ J. Swinnen, ed., Political Economy of Agrarian Reform in Central and Eastern Europe, Ashgate, Aldershot (1997). ^ a b c d e f g h i j k l "CEE countries". 9 August 2011. ^ a b c d e f g h i j k l m Directorate, OECD Statistics. "OECD Glossary of Statistical Terms - Central and Eastern European Countries (CEECs) Definition". stats.oecd.org.